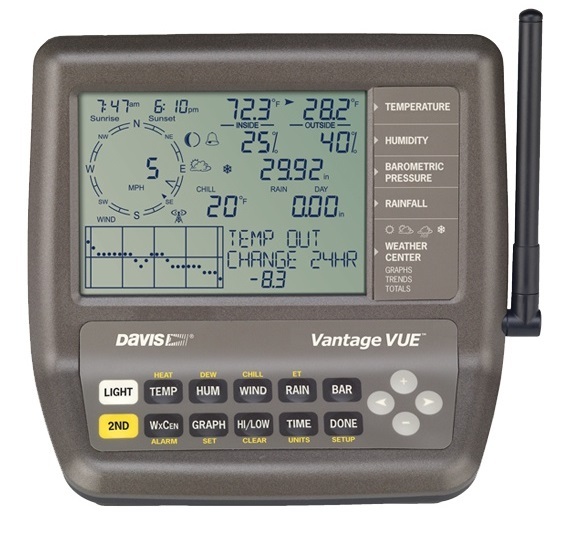 Only a few weather stations today can have the best features that would actually match up with the properties of the Davis Instruments 6250 vantage vue wireless weather station. The product when compared to other models, it often seems to deliver more features ahead of its time. The manufacturer integrated it with many great sensors important for the detection of various weather conditions. Many people today could easily see it as the best weather station to use for various weather condition detection. In this review, we get to see what you can easily gain from using this model of a weather station more often. For those who are yet to use the Vantage Vue model, be prepared to be satisfied by the number of options you can get with the model. Due to its high reliability, the model has received a lot of love in terms of ratings. Many people who have used it would recommend it to others so that they can also feel that experience too. You will get numerous options on the screen, but the best part is that you can easily reconfigure it to display what you want. Switching between different console options can make you learn more about the weather conditions in your area. You can have the data displayed in different periods so as to have a conclusive decision. In such cases, it should be easy why it is among the top models on the market today. To make it easily handle the competition with other comparable model, the manufacturer invested so much engineering when it comes to developing the sensors. In the end, it is now what we have as the Integrated Sensor Suite (ISS) for this model. The work of the ISS is to house all the necessary sensors you would need for the different weather condition detection. Some clever features you can expect from the model include having a self-emptying rain collector. So long as the model can collect rain to a preset level, there is a tipping spoon that can help with the self-emptying of the rain collector. The anemometer on the other hand can help in recording the wind speeds from around 2 to 150 mph. That is quite impressive as any slight change in the wind speed would easily be recorded. The same thing goes the other sensor types included in the model. With the impressive accuracy, then it is possible for you to easily make decisions about your day knowing that the weather station offers accurate data. Protection from the environment is quite crucial when you are looking to mount your weather station outdoors. The weather station should be made of strong material that can withstand the extreme weather conditions. You are in luck when at the end you buy the 6250 vantage vue model. It comes with a weatherproof cover important for the weather station to work effectively outdoors. The weatherproof cover is designed to be highly durable and still corrosion resistant. You can now be sure that your highly sensitive sensors are well covered to keep them working correctly. As part of additional protection to the sensors, the model comes with a radiation shield too. Your sensors can now be protected from the solar radiation and other types of reflected heat from other materials in the surroundings. Installation should be easy for someone who is yet to try out this model. The manufacturer included all the necessary mounting hardware you would need to handle the installation process. You can always check out this video to help you get started with the installation. The type of instruments would often affect the type of weather conditions the weather station can measure. It is common that many people would want more instruments. The ISS suite of the Vantage Vue model will have the following instruments. To help you analyze the kind of data from the weather station, the manufacturer still offers an additional software. Well, it does not come with the product, but you can always have it as an additional buy with the weather station. These instruments would not work perfectly if there were no sensors. The sensors are crucial to ensure that they can deliver the best readings all the time. To start us off, you will get temperature sensors integrated in this model. The temperature sensors can give you the readings for both indoor and outdoor ranges. You also get the same giving you the relative humidity in an area too. The anemometer sensors are also designed to offer more accuracy in terms of determining the changes in the wind speed. With an increased accuracy in the sensors, the model is able to detect any few changes in the wind speed and direction too. Most weather stations would be either wireless or wired. For this model, it is designed to be a wireless model. The wireless capability has always made it possible for many people to use it remotely so long as you are within the range as given by the manufacturer. The weather station has a frequency spectrum of 902 to 928 MHz. Such a frequency spectrum helps with having consistent transmission of the data from the sensors to the console. With a range of about 1000 feet, it is easy to see that using it in various locations would be easy. The console that comes with the weather station might not be the prettiest thing you will see, but it always delivers on functionality. Many people would always wish they could have got one with a colored screen, but the amber colored screen still serves the purpose. The console is amazing regarding the amount of information you can actually get when using it to view the data. On the display, you will get information such as forecast icons, weather graphs, sunrise and sunset time, the moon phases, alarm settings and many others. Since the data is well organized, then it should easy for many to read the data from the screen. The LCD display has a sensible size of 3 by 4.374 inches, which is enough to display enough data from the weather station. You can customize just how much data you want to view on the screen to avoid confusion. The display still has the backlight feature. Whenever you are not able to see, you simply have to turn on the backlight on. Whenever it is no longer needed, then you simply toggle it back to off. The console also has a timeout for the backlight when running on battery as a way of saving the battery life. The source of power is commonly an important factor that many people would want to consider before they can buy a weather station. For the Vantage Vue model, it is powered by a solar panel and a backup 3-volt lithium battery. During the day, the ISS unit will be using the solar energy while at the same time it will be charging the backup battery. At night you will still get the readings from the weather station as it will be now using the power from the backup battery. The best part is that the battery could last longer during the night hours and sometimes overnight. The console on the other hand can be powered by an AC supply or 3 C batteries. It is always great if you can end up having more batteries with you for backup. This ensures that the console will keep on operating and provide you with the data whenever needed. 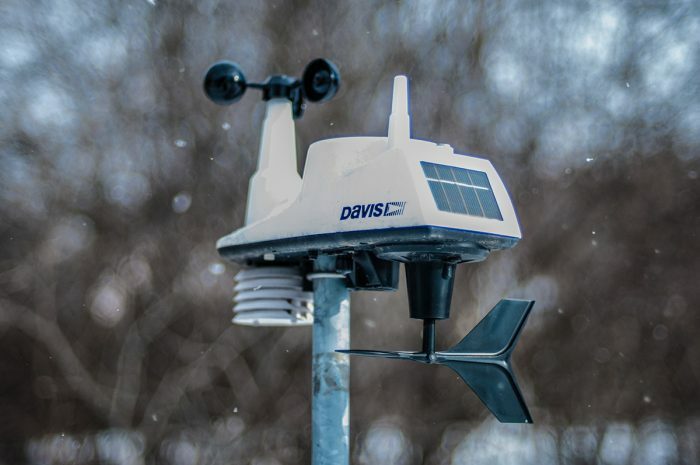 As a way of enhancing the connectivity of the weather station, you will get the Davis Instruments WeatherLink USB software. The software is what will connect the weather station to your PC. The software is amazing in terms of the different analysis features you get when viewing the data via the PC. The USB module still comes with a data logger important for storing the data even if the PC is not connected. This means that you get to view the data hours later once you connect the PC. From the software interface on your computer, you can select the storage interval as from 1 to 120 minutes. To ensure that you can actually end up with the best mounting hardware, the manufacturer can also sell you a few accessories. The Davis Instruments Mounting Pole kit is amazing in all aspects. You can now mount your sensors easily. 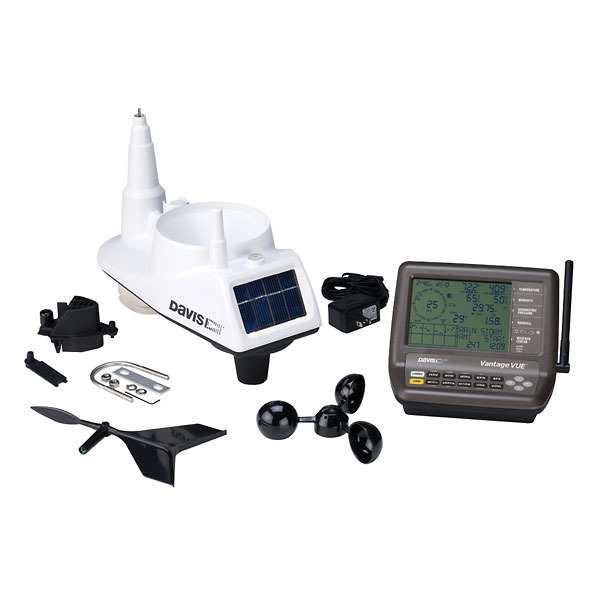 The manufacturer offers a one-year limited warranty on the weather station parts. In case of any problem with the weather station, you should contact the customer support team first. Trying to fix the wireless station on your own could make the warranty void. The weather station will offer you an impressive wireless range. The 1000-feet wireless range makes the weather station to be at the top of its league with other playing catch-up. Using your weather station console should be easy so long as it is within the recommended range with the wireless sensors. The alarm system used in the model is crucial to alert you about the different weather changes in your area. With a massive number of 22 alarms, you simply need to choose the right alarms that you need. Some of the notifications would include rain rate, freezing temperature rates, strong winds, and many others. You will be able to compare the different data types with this model. It is important that you always get it right with the comparison tool. The feature is normally indicated as ‘This Time Yesterday’. You can check the differences in the weather conditions so as to plan your day ahead. With every minute that passes, the user is able to learn more about some changes in the weather conditions. The sensors are designed to provide the updates to your console every minute. You can be in a position to learn about these differences in no time, especially the wind speeds, as they tend to be instant changes. The manufacturer to make it easy for the users to operate the model. It is the reason the display console comes with easy to use features. The buttons are well-labelled and spaced so that you can have an easy time operating the module. Having the glow in the dark keys is another feature that should enhance the night usability for most people. The graphs provided should give you an opportunity to learn about the trends of a specific weather condition. You can switch between the different graphs and also the time frames. You can view the graphs with data in the past 25 hours and even the last few months. These graphs would have information about different sensors such as the rain, wind, barometric pressure, and the temperature. To ensure the sensors always deliver the correct readings, the model does come with an impressive solar radiation shielding. We all know how the direct exposure to the sun will ultimately affect the different readings from the sensors. Some with really spike an example being the one sensing the temperature. The weather station is not going to last you for a lifetime. You may have to start replacing some parts after using it for about 5 years. It can even be earlier than 5 years if you cannot take great care of the weather station. These new parts will need money to buy them and set up again to ensure that the weather station is working properly. Some users have complained about the manual they get with the model. Some parts are clear, while others need reading more than once just to get what they mean. When you check out the console display, it is not a colored screen. For a model that comes with many amazing features, the screen should have been colored. Some people often find it hard to view the data at certain angles or in bright sunlight. You have to purchase the software separately when you need to have it for additional data analysis. From the review above, it is easy to see why the model has been grossing a right rating in online stores. It is because people have now found a weather station that delivers to their expectations all the time. The model in general is an impressive buy in the sense that you will not be paying a lot for the features you can get from it. Comparing it to other Davis Instruments, it is easy to see that it is on the lower side of the price. The model could be great for both beginners to the professional looking to learn more about the different weather conditions. Get the weather station today for yourself if you want to keep yourself updated with the weather conditions.